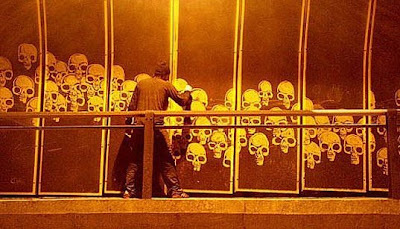 Here is another cool guerilla marketing/message post on Environmental Graffiti, that my brother Patrick found of this guy Alexandre Orion (cool last name) who "painted" skulls on the inside of a tunnel in Sao Paolo, Brazil by wiping away dirt caused by car emissions to create the art. The point was to get people to think about the impact they have on the environment. Brazilian authorities didn't charge him with anything, but washed that side of the tunnel. 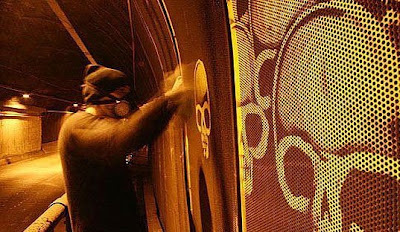 Then Orion did another mural on the other side, they washed that too, then they ended up washing all the tunnels in the city. 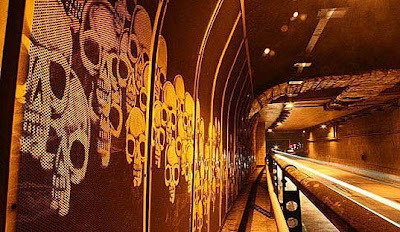 Although it may not have had a huge impact on reducing green house gasses, at least it got people to notice and made the authorities clean all the tunnels (with tax payer dollars I would assume). Not bad for just one guy, a towel, and water (and a gas mask). I can't believe the authorities just washed that toxic soup right down the drain and into the ecosystem. Gnarly.